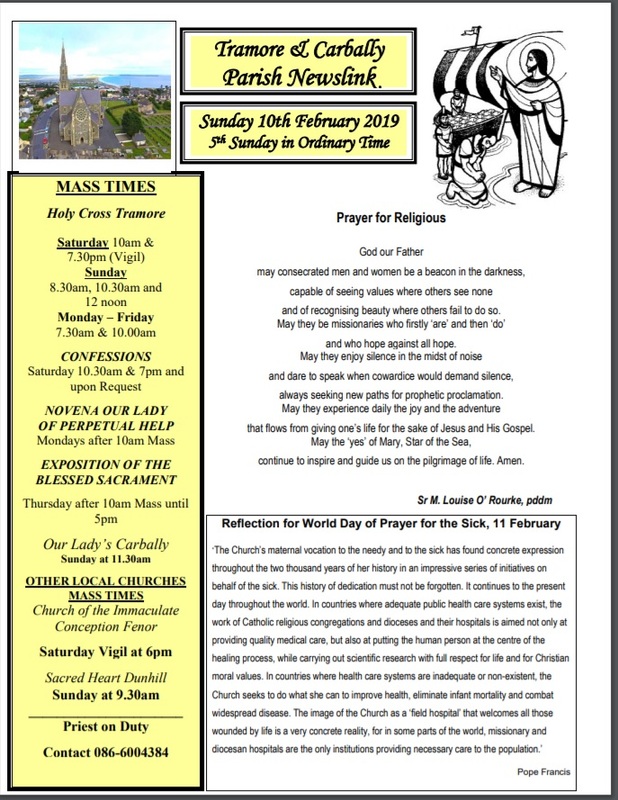 In this weeks newsletter we remember all who are sick in our community on World Day of Prayer for the sick Feb 11th. ‘The Church’s maternal vocation to the needy and to the sick has found concrete expression throughout the two thousand years of her history in an impressive series of initiatives on behalf of the sick. This history of dedication must not be forgotten. It continues to the present day throughout the world. In countries where adequate public health care systems exist, the work of Catholic religious congregations and dioceses and their hospitals is aimed not only at providing quality medical care, but also at putting the human person at the centre of the healing process, while carrying out scientific research with full respect for life and for Christian moral values. In countries where health care systems are inadequate or non-existent, the Church seeks to do what she can to improve health, eliminate infant mortality and combat widespread disease.